Incepted in 1992, Vasisht Agencies (P) Ltd. is a Retailer and Trader and fastest growing firm indulged in offering wide range of Blinds and Flims. We provide our clients for Window Blinds, Curtain Rods and PVC and Vinyl Floor. These products are designed employing high grade material and components in harmony with set industry norms and standards. Product offered by us is long lasting and provide utmost satisfactions to the clients. Offered product is extremely commended amid the clientele for their exceptional quality, application specific design and flawless finishing. To cater the increasing demands and necessities of our client, we provide these products in varied stipulations. In addition to this, we present this product to the patrons at inexpensive prices. To design and develop these products as per the set industry standards, we have maintained a well equipped and advanced infrastructure facility. Our infrastructure is equipped with the advanced tools and equipment necessary for the developing of our accessible range. To develop these products as per the newest market trends, we upgrade our facility time to time. For a hassle free and optimum working environment, we have divided our infrastructure into several units. Our trained employees work together as a team to achieve the set goals and objectives in best possible way. With the leadership of our Director Komal Vasisht, we have made ourselves as a leading name of this realm. Due to her affluent knowledge, executive skills and quality centric business approach, we have been able to build a huge client base. Vasisht's are one of the largest Bulk suppliers for carpets/floorings in exhibitions on all India Basis with establishments in Delhi, Mumbai & Bangalore. Vasisht's are authorized contractors for Confederation of Indian Industries (CII), India Trade Promotion Organization (ITPO) and other leading big organizations in the Exhibition Industries. Non-Woven carpets, Coir mattings can be provided and maintained by us during the exhibition both on outright sale & rental. We have a very prestigious client base in India and we aspire to cater beyond the contours of our domestic business circuit. 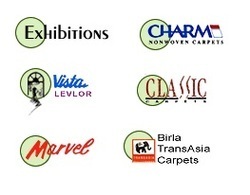 We take pride to be recognized as one of the leading and largest carpet suppliers to various Industrial houses, Govt. offices, Govt. Institutions and Private Establishments across the country. We are registered with C.P.W.D. for catering to the govt. departments for their requirements. We always follow customer centered approach and effort hard to meet the accurate necessities of our patrons by offering wide range of Blinds and Flooring. All these products are made by the crew of highly capable and trained employees, who have earned rich experience in their realm. For the ease of our respected patrons, we also accept payment through several modes. In addition to this, our transparent business dealings and on time execution assisted us to attain at the peak of success. We are the dealing in the following Brands.